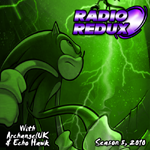 Sometimes timing just happens, and thats whats occurred here because the next Radio Redux 511 has gone online – a solo show by Echo Hawk as well as the next show returning from Season 1 (2006)… the Room 101 show with Echo Hawk. Its an Echopalooza! AAUK’s taking a week off from Hedgehog related doings, as frankly even he can only take so much. So Echo Hawk is here for a solo show on the new software, will she sink or swim, or whack people with a stick? With Chaotix X Episode 4 at it’s climax, what’s the best way to come up with an original idea? Rip off another one shamelessly. 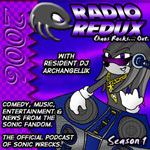 So ArchangelUK fronts the first part of a special version of Room 101 with (at least until the connection is lost) his first guest SW fan artist extraordinare Echo Hawk in the hot seat. Queue discussions about Mephiles, ShadRouge, Asian Drivers and whether or not AAUK has come close to dying. The answer might surprise you.